I recorded this video of Jake and EJ when we celebrated Justine's birthday at Raccoon Park in PA. Hubby always says that dancing and singing are very common talents of Filipinos lol. Please watch our burritos dance moves hehehe. When I got done watching our kids' dance video, this one popped up too. These two kids are so talented. Watch it guys, they will make you smile. Here's the fun shots that me and my daughter took of ourselves after she changed her clothes and put on her bathing suit. These were taken during our friend's daughter's birthday. Me and Mommy, just having fun inside the cubicle hehehe. I would like to thank a very good friend who gave me this cute shirt from New York, thank you so much Shy for being so thoughtful! 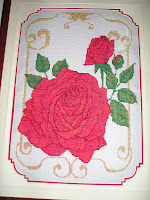 The photos above are just some of the corss stitch I made when I was pregnant and didn't know blogging yet lol. ow I wish I could still do it because it is a very relaxing and yet addicting hobby. 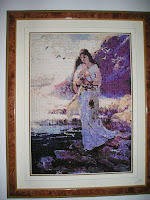 I found a place where you can buy wholesale cross stitch kits online and I love their selection.